You need a solution for your kids’ boredom. You just want 5 minutes to go to the bathroom by yourself. Or not hear anymore whining. You need to make slime. Actually you need to take that one step further and make melted snowman slime. Trust me. Slime is the answer. It’s great for rainy days. Cranky kids. Sick days. Party favors. Play dates. <–You get the idea. It’s awesome. With 3 young kids at home I am always on the lookout for anything easy and fun. I needed a simple party favor idea for my son’s class party next month and melted snowman slime came to mind. I knew my kids love to make and play with it and other parents would be happy to be taking home a boredom buster instead of more candy! My kids love simple science so they jumped in to help. Making melted snowman slime is a great simple science experiment for kids. Once we made it, the kids could not wait to play with it…looks like I will be making more slime for the party so they can keep this batch. I used one bottle of glue but to make more slime you can just double or triple the recipe. The kids emptied the white glue into a bowl. I then added about a cup of liquid starch. I do not measure the starch anymore I just add it to the glue until you get a slimy but not too sticky texture. Once we mixed the glue and starch well with our hands the kids added silver glitter! We mixed it a little more to mix in the glitter. Now we had melted snowman slime. 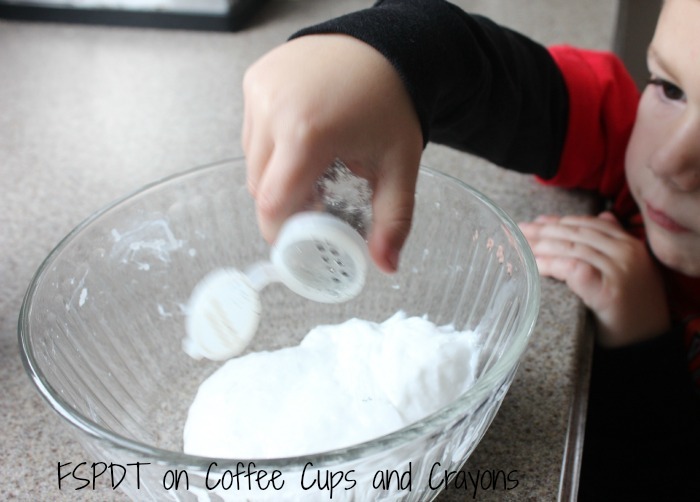 You can also add your favorite scented essential oils to slime for a fun scented play recipe. I forgot it in this batch but I might add peppermint to our next one. 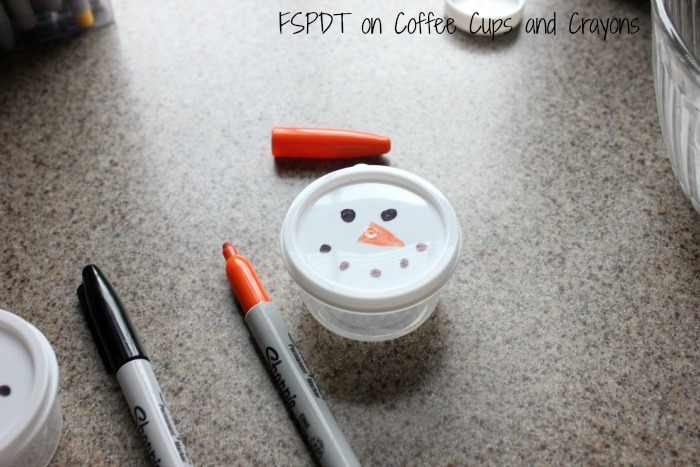 These small plastic containers from the dollar store are perfect for party favors. Just take the black and orange sharpie marker and draw on a nose, eyes, and a mouth. This is a great “busy” activity for kids. My kids loved squeezing and stretching the slime in their hands. They added the snowman face to the top of the “melted snow” to make their melted snowman. Don’t you just love simple and easy ideas like this? 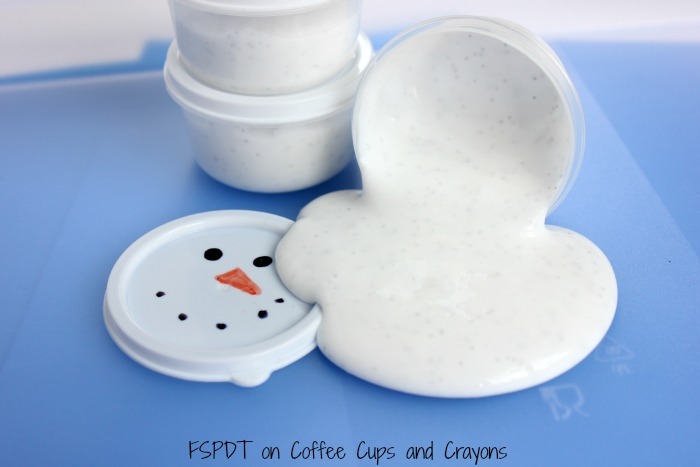 Your kids will enjoy the melted snowman slime as much as mine did–make it today! Join the 100 Acts of Kindness Project today! What size was the glue bottle? Oops. Sorry, I see it was included in the recipe. Thanks. Hi! I love this idea!! I think it would be fun even for my grandsons birthday party in February. He will be 11. My question before I send this to my daughter, is how do you clean up? I’m sorry, I think of glue, and all I see is carpet and hair not recovering!! He he! That is a very good question! The slime will be sticky so you’ll want to keep it away from fabrics and hair, but its not as messy as you’d think. If you happen to get it on or in something try vinegar to dissolve it out! How many of those little cups did one bottle of glue make? How big were your small cups? I am not seeing them at our local dollar store and looked online at one that I have near work and they look similar to what you have online, but there isn’t much of a size comparison in your pics other than the sharpie marker! Are they smaller than the Glad plastic small containers which are 4 oz? If they are like the ones I saw online they would be more like 2 oz. Yes, these are more like 2 oz ones, but you could always use the 4 ounce ones and double the recipe or just fill halfway! I’d double it to be safe! HI Meghan! You probably want to double it then to be safe. I just tried to make this and added just a little less than 1 cup of the liquid starch and it was way too much! About half of the liquid is sitting in the bottom of the bowl and the “slime” is really stringy! 🙁 My daughter still enjoyed playing in it but will have to try another batch as we wanted to give this away as gifts! EDIT: We ended up adding another bottle of glue and a little more liquid starch and it was perfect! Oh no! Yes though! That is exactly what to do. We make slime a lot and sometimes have that issue before too. The other common problem is not kneading it enough. Luckily it’s pretty forgiving so you can keep adding to it. I tried it in advance to make sure I would be pleased and I have to admit this Grandma was a total fail at making Melted Snowman Slime! The glue and starch didn’t mix well together at all and I ended up with a lumpy watery bowl of ‘stuff’! I didn’t use my hands, but a spoon…could that be the issue?? Hi Dianna! Oh no! Someone else just add that problem too! Try adding more glue if it’s still stringy and kneading it with your hands for awhile. The longer you do it the more it becomes slime-like. I’ve gotten it at Target and WalMart and Walgreens before but I’m guessing the grocery store has it too! Making snowman slime for a class party. 20 kids. Would 3 batches be enough for 20 2 oz cups as shown? 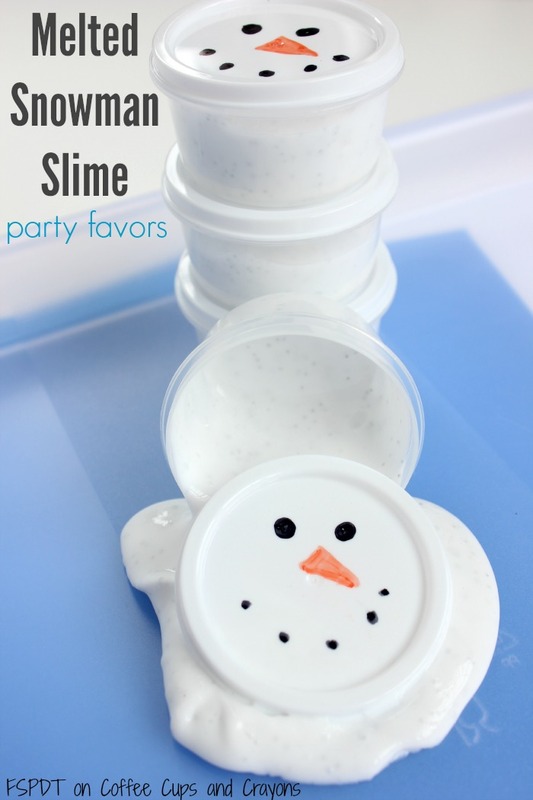 How far in advance can I make the snowman slime so it keeps well as a party favor in a plastic twist top container? If you have it in a container it should be good for at least a week or two!